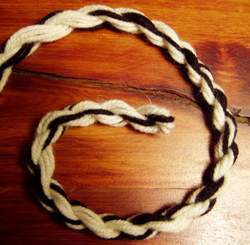 Ever made a twisted cord? They're so easy you need to find out how to make one, then you'll find all kinds of uses. I promise. I honestly thought everyone knew how to do this, but when I told Marly how I'd made the handles to one of my bags, she asked me to show her, now here I am showing you too. All you need is yarn, scissors, and either someone to hold one end of your cord, or a window handle or door handle to hook it on. Cut yarn 4 times the length that you want your cord to be (5 times the length if you're felting it). So - if you want your handle to be 1 yard long, cut your lengths 4 yards long. The number of lengths you need depends how thick you want to make your cord or handle. 3 strands will end up as 12 strands thick, 4 strands will be 16 strands thick, etc. 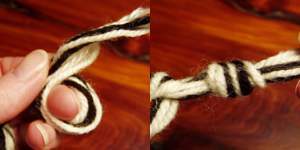 Smooth the yarn so that all the strands are even and tie the 2 loose ends together in an overhand knot (see below for overhand knot pics) - don't pull too tight as you may want to untie it to fasten it into a purse handle. Making sure that your yarn is folded exactly in two, have someone hold the other end or loop it over something so you can have some tension on it. Holding it taut, start twisting your yarns one way only, over and over until the whole length becomes tight and firm. It should feel like it's just about to get too twisted and go bumpy. Stop twisting. Keeping tension on the end you have, reach for the center of the cord, then hold the center with one hand and bring the 2 ends together. Holding the 2 ends together let go of the center and allow your cord to twist on itself - untie the original knot and tie these 2 new ends together with an overhand knot again (loosely). When it's done twisting, if it looks uneven, firmly grasp above the uneven section and run your hand over that section pulling out the kinks. Try this several times until your twisted cord looks even. When you're happy with the way your cord looks, then you can use it any way you like. By the way - to tie an overhand knot - holding the long end of yarn in one hand, wrap the short end of yarn "over" your fingers from front to back then up to front again to make a loop, then bring the short end over the spot where the yarns cross and through the loop from the back to the front and pull to tighten. Thread each end through individual holes at the top edge of your tote and tie knots large enough that the handle won't pull through the holes. You can thread them so the knots are either hidden on the inside or showing as a decorative touch on the outside. Again, thread each end through the holes in your bag but this time tie the ends together. The way I like to do this is to undo the knot at the tied end, thread one of these ends through the fold at the other end of the cord. Bring the loose ends together and tie in an overhand knot. Trim ends neatly. (See pics below). Thread in and out of holes made around the top of a purse (to gather), then, bring the cord ends together. Tie an overhand knot about 3 inches from the ends, then snip through the folded end and shake loose to make a tassel. Trim to the length you like. I'm certain you can think of many more ways to use this very easy but quite effective twisted cord.